Microsoft removed Windows Media Center from the company's Windows 10 operating system. While there are some alternatives for Windows Media Center out there that users can switch to and use, some would probably prefer to use Windows Media Center on Windows 10 as well. 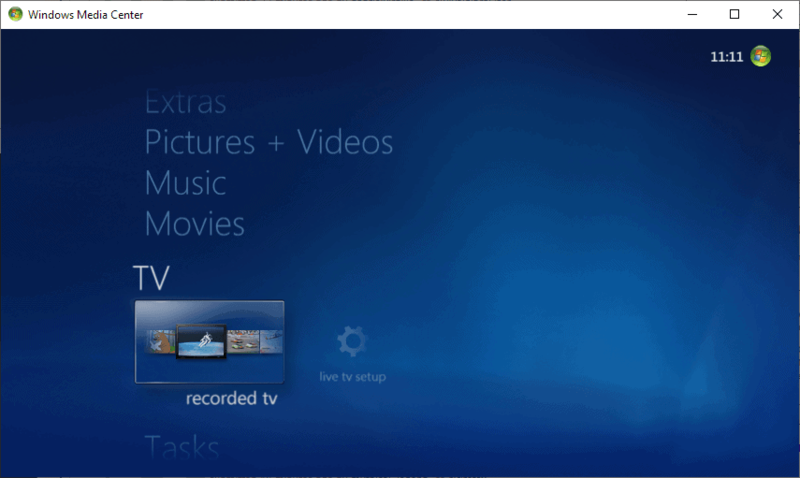 Windows Media Center can best be described as the big brother of Windows Media Player. It features playback functionality for media but also additional functionality such as TV tuner and recording support, and better media management options. Windows 10 users have two main options when it comes to Windows Media Center on Windows 10. They may install one of the suggested alternatives, e.g. Kodi or Plex, or install a custom version of Windows Media Center that is compatible with Windows 10. WMC is a custom version of Windows Media Player that is compatible with all versions of the Windows 10 operating system. Note: It is recommended that you create a backup of the system prior to installation. I did not run into any issues installing and removing the custom Windows Media Center version from a Windows 10 version 1809 system but it is always good to be on the safe side when it comes to software installations. 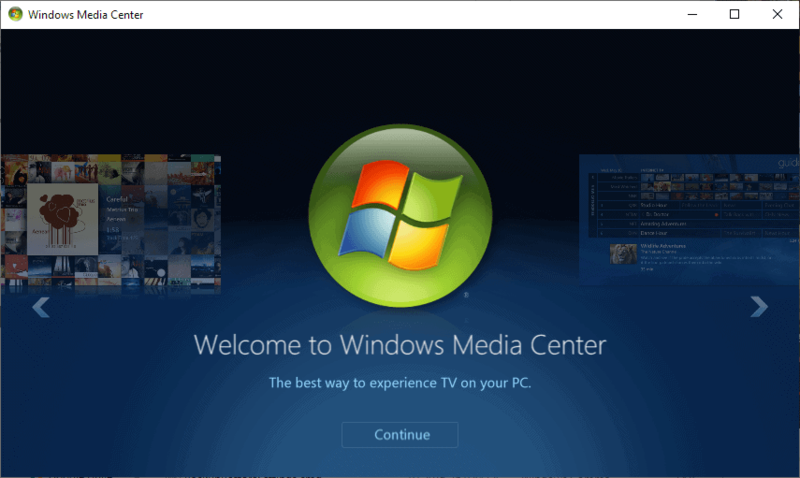 WMC installs Windows Media Center on Windows 10 machines. The functionality is more or less identical to the official version of Windows Media Center for previous versions of Windows. Installation is powered by batch files. First thing you need to do is downloaded the most recent version of WMC from the developer website. The site is in French; use a translation service if you don't speak French. Check the Installation category on the site for updates. The most recent version is WMC 8.8.2 at the time of writing. Download the latest version of WMC and extract the archive to the local system once you are done. Run the following batch files afterward. Note that you can right-click on batch files and select Edit from the context menu to see exactly what they do. Right-click on _TestRights.cmd and select "run as administrator" to test privileges and permissions. Right-click on InstallerBlue.cmd or InstallerGreen.cmd and select "run as administrator" to install Windows Media Center on the device if the test batch file did not return any errors. The batch files install the Blue or Green interface versions of Windows Media Center on the device. WMC lists all installation steps in a command prompt window after execution. Windows Media Center is installed afterward if things went well. 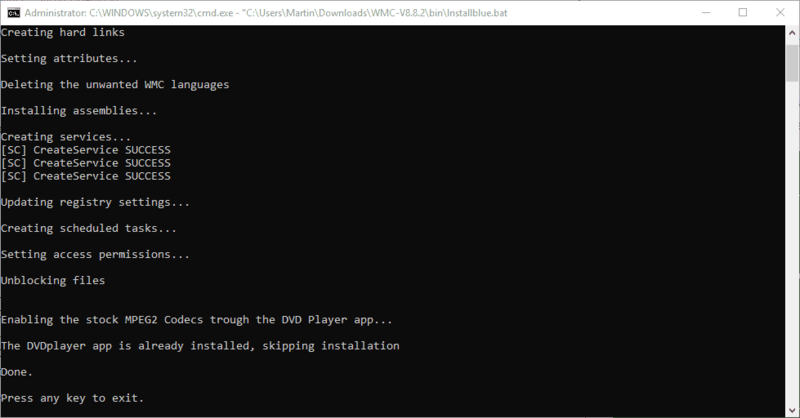 Tip: WMC comes with an uninstaller script that you may run to remove the program again from the system and undo the changes made to it during installation. Just right-click on uninstaller.cmd and select "run as administrator" to remove the program again from the system. Feature upgrades remove essential files from the system so that Windows Media Center won't work until you run the installer again. You can start Windows Media Center from the Start menu just by typing its name. 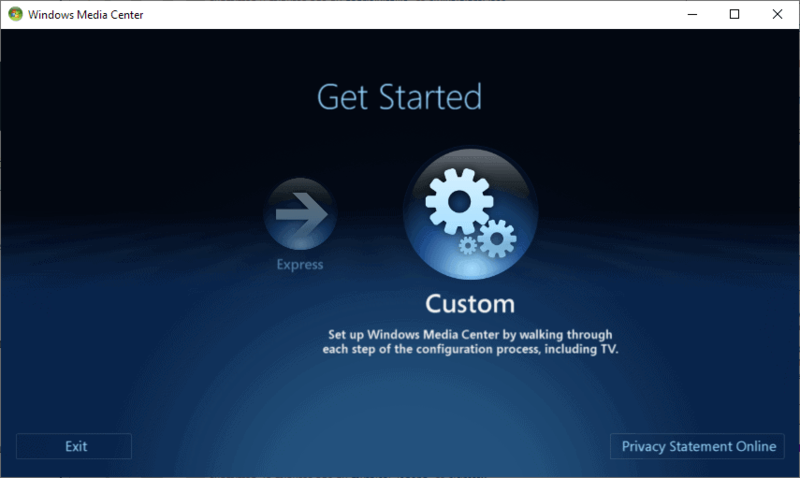 Options to set up Windows Media Center using express and custom options are listed on first run. It is recommended that you select custom as you get full control over setup. The program displays its main screen afterward. Windows Media Center picks up some folders on the device automatically but you can add more folders to the libraries so that media that is stored in those folders is listed by the media player as well. WMC installs Windows Media Center on Windows 10 devices so that users who are accustomed to the program and don't want to switch can continue using it. Now You: Do you use a media center program? Interesting, but I wonder if there are another updated (and more compatible) alternatives to WMC, to be run under Windows 10? Great information unavailable from anywhere else. Most tech sites are horrible today, reduced to walled-garden product advertisements. I used to use WMC 8.0 for years but then MS sold the Program Guide responsibilities then proceeded to data-mine what you watch. This trend has only worsened with Win10. After WMC switched to Ubuntu 16.04 with a customized Linux OS to handle the Quad Hauppauge pci-e 1x tuner. But then Canonical forced users (by removing the release letter) to ‘upgrade’ then proceeded to also increase data-mining. Another dead-end! The total, lasting and most rewarding solution is LinHES, a complete dedicated Mythtv frontend AND backend. It ONLY works properly with a small Sata III boot SSD and a 3-8TB recording HDD. Combine with Nvidia (I use a 1050) graphics card and micro/ATX board. Note: m-ITX boards will not work pci slot-wise! The key privacy concept here is the GUIDE is already transmitted within the OTA broadcast signal called EIT. No Internet connection is required unless you, the owner allow. The icing is Kodi 17.6 is included in the release to play back network movies, songs, photos and games. These two powerful programs interface seamlessly! In my two systems have no errors with framerates, dumb, degrading Pulse resampling, audio formats or speaker channel assignments. Both LinHES and Kodi pass-thru all native Hirez formats including Dolby Atmos. Free. One stop shopping. Plays almost everything. Total privacy! Takes basic Linux expertise with chown chmod .bashrc etc.. Even with a powerful system native 4K frame-rate is too slow (Kodi 18?). can’t read site french and see no way to swap to english. chrome/waterfox all fail translate. anyway I have media server setup using mediaportal (I use 1.x version) and does dvr stuff. client pc can also watch live tv served by it. forgot to mention server is win7 and clients are win10. mediaportal seems to work ok on win10. My copy of Windows 10 Pro 1803 has Windows Media Player 12 installed. Is this post intended for users with versions N/KN of Windows 10 ? Shouldn’t it be ‘Windows Media Center’ ? Martin (or anybody else who knows this) I have already the Windows media player 12 installed on Windows 10 64 bit pro. system. Do I have to uninstall the Windows media player 12 first before I can install the Windows media center 8.8.2? This so there will be no conflicts between them or can I leave Media player 12 and they will work both independent of each other? They should work independently. Windows 7 has both WMP and WMC. Afaik M$ft intends to remove the Win32 WMP from Windows 10 in future as well and replace it with some inferior UWP solution. Using version 8.8.1 in latest Win10 ( 1809) , works fine . I wonder ; can I install this 8.8.2 over previous , or do I have to uninstall it first……?? I have a version somewhere on my external drives that works on Windows 8.x to. Does this work on 8.x to or only 10 ? While there are countless other blogs and sites, distributing older and/or modified packages from the actual MDL thread without any consent, it would be better to cite the original source. I have tried Media Portal with iffy results, and the software that came with my TV Capture card, and neither of them are as good as WMC. Yesterdays Windows 10 Update not only borked WMC, even uninstalling and reinstalling it doesn’t work. All the files are there, but something is stopping it from running. Working fine for me on winver 1809. I had recently done a wipe and reinstall of windows 10, so it is a virgin OS, no prior configurations of anything. My hardest part was finding the exe file to run WMC! In search box, start typing its name ‘windows media center’ and you will see it. I installed this after win10 updated and killed WMC (again). It works great except how do I get the guide data back? will not download guide data. any suggestions or links on how to get the tv guide data back? I know I did this last year or earlier when they switched guide providers, but I cant find the info on how to fix it now. being used to record USA OTA tv only.